Napping and Rest Cots for Toddlers,Preschool and Daycares with Accessories provide a sleeping environment for Children ages 2-6 years old. Imagine how pleased families will be when you offer special bedding options designed to provide quality sleeping accommodations for toddlers and preschoolers. Great for Daycare centers too! An ideal solution for children ages 2 to 6 years that may be too big for a crib and too small for a full size cot or when room dimensions restrict the use of a full size cot, these products are perfect portable toddler beds. Selection includes Rest Cots in both standard and toddler sizes, Toddler Cots and Wood Toddler Beds. Perfect for Daycares, Schools and more. See Toddler and Cot Bedding for Sheets and Blankets. NEW PODZ ULTIMATE COTS - State-of-the-art construction has no exposed hem which eliminates fraying. Steel frame with integrated feet provides the ultimate in durability. Best 10 Warranty available for cots. 100 lbs weight limit. Patent pending design allows cot to flex making naptime more comfortable. Ergonomic shape fits children’s bodies better and provides more usable space. Unique foot design has no channels or wells to collect dirt and germs. Podz™ eliminates those tough-to-clean areas. Fabric can be cleaned again and again. Completely enclosed, no-gap design prevents small fingers and toys from getting lodged in openings. Stack in less space than all other cots! 20 cots stack less than two feet high. Numbering System makes it easy to assign cots and keep things organized. 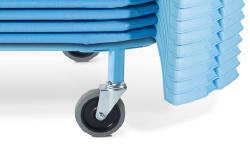 Carrier stores up to 50 stacked Podz Cots and makes it easy to maneuver them into storage when not in use. Available in Canada only. AFB5730 - SPACELINE STANDARD SOF-TEX COT - 52" x 22" x 4 1/2"
AFB5731 - SPACELINE TODDLER SOF-TEX COT - 40" x 22" x 4 1/2"
Value Line™ Cots are made of tough vinyl-coated mesh bed with a “super-grip” closure at the foot end to adjust tautness. 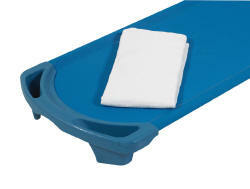 Cots are easy to wipe clean and accommodate up to 110 lbs. Save on Shipping costs with Unsassembled cots. 10 Year Manufacturer Warranty - available in Ocean Blue only. Standard Cot is 52 x 22 x 5 in. Toddler Cot is 52 x 22 x 5 in. 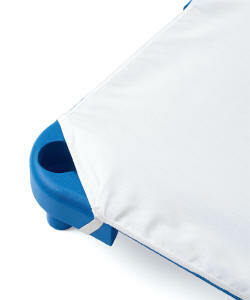 Universal Activity Panels 4 Pack add function to cots when not in use. The 4 pack includes one of each panel: flannel activity panel with 30 shapes, pegboard with 25 sure-grip pegs, write-and-wipe with 30 magnetic letters and brick-compatible with 36 MEGA® Bloks. The panels fit all Angeles® cots. Activity Panels 19 x 14 x 5 in - Available in Wedgewood Blue(AWW), Teal Green(AGN), Ocean Blue(AOB) - 3 Year Warranty. For ages 3 and up. 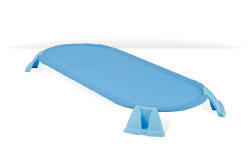 51" x 21" x 4-3/4" For use with up to 24 Cots - 7 year guarantee. 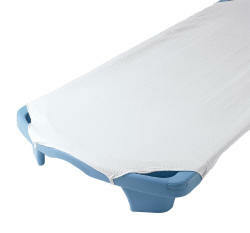 Cot Sheet is made from poly/cotton blend with elastic loops keep sheet neatly in place. Sheets are machine washable and dryable. 1 Year warranty. For spaceline cots. Available in sets of 6 only. Organic White Blanket is made from 100% organic, washable soft cotton. Blanket is machine washable and dryable. 1 Year Warranty. 54 x 36 in. Available in sets of 6 only. Organic White Sheet is made from soft, 100% organic cotton with elastic loops keep sheet neatly in place. Sheets are machine washable and dryable. 1 Year Warranty. Available in sets of 6 only. Value Line™ White Cot Sheet is made from 50% polyester / 50% cotton with elastic loops sewn on all 4 corners. Sheets are machine washable and dryable. 1 Year Warranty. Available in sets of 6 only. Discounts for multiple orders. Contact us for customized service. Discounts for payment by e-transfer or wire transfer.